Abstract: The aim of this study was to obtain the genotype and gene frequency from parents of children with attention-deficit/hyperactivity disorder (ADHD) and then assess the Hardy–Weinberg equilibrium of genotype frequency of the variable number tandem repeat (VNTR) III exon of the dopamine receptor D4 (DRD4) gene. The genotypes of the III exon of 48 bp VNTR repeats of the DRD4 gene were determined by polymerase chain reaction in a sample of 30 parents of ADHD cases. In the 60 chromosomes analyzed, the following frequencies of DRD4 gene polymorphisms were observed: six chromosomes (c) with two repeat alleles (r) (10%); 1c with 3r (1.5%); 36c with 4r (60%); 1c with 5r (1.5%); and 16c with 7r (27%). The genotypic distribution of the 30 parents was two parents (p) with 2r/2r (6.67%); 1p with 2r/4r (3.33%); 1p with 2r/5r (3.33%); 1p with 3r/4r (3.33%); 15p with 4r/4r (50%); 4p with 4r/7r (13.33); and 6p with 7r/7r (20%). A Hardy–Weinberg disequilibrium (χ2=13.03, P<0.01) was found due to an over-representation of the 7r/7r genotype. These results suggest that the 7r polymorphism of the DRD4 gene is associated with the ADHD condition in a Mexican population. Attention-deficit/hyperactivity disorder (ADHD) is a developmental condition characterized by inattention, hyperactivity, and impulsivity that has a prevalence of 5.29% in childhood and, in some cases, may persist into adulthood.1 ADHD is considered a multifactorial disorder because it results from the interaction of multiple genes and environmental factors, though the genes responsible and their respective contributions have not yet been clarified.2,3 Faraone et al4 estimate a heritability of 76%, which is the proportion of phenotypic variance attributable to genetic variance. The remaining 24% represents the disorder variance attributable to environmental variation, in which case a patient’s first-order relatives could have genes related to ADHD but may not report symptoms of the disorder. In addition, it has been pointed out that the DRD4-IIIe-7r polymorphism is associated with an inaccurate, impulsive response style on neuropsychological tasks.11 While these behaviors are characteristic of ADHD disorder, the allele frequencies of the DRD4 polymorphisms in the first-order relatives of an ADHD patient have been studied very little in Mexican populations. Therefore, the aim of this work is to establish the genotype and gene frequencies in parents of ADHD cases, and assess the Hardy–Weinberg equilibrium of genotype frequency in relation to the 48 bp VNTR III exon of the DRD4 gene. The present study was approved by the Ethics Committee of the Neuroscience Institute in Guadalajara, Mexico. The parents of ADHD cases were recruited from a sample of children previously diagnosed with ADHD in a study of the prevalence of this disorder among Mexican school-aged children (Barrios O et al, unpublished data, 2015). With regards to subjects’ demographic data, we chose children from public schools, since they represent 92% of Mexico’s elementary school population.12 Thirty-six families of children with ADHD were contacted and 19 of them accepted the invitation to participate in the study (refusal rate =47%). Both parents participated in eleven families, in five families only the mother was available, and in three cases only the father was tested. Thus, the final sample consisted of 30 parents (14 men, 16 women) with a mean age of 49.1 years (±7.45 years). All the parents answered a questionnaire based on the ADHD criteria of the Diagnostic and Statistical Manual of Mental Disorders, Fourth Edition (DSM-IV) and a retrospective Wender Utah Rating Scale (WURS) of ADHD symptoms in childhood.13 The mean they reported for symptoms of inattention on the ADHD questionnaire was 1 (±1.66), while the mean for DSM-IV hyperactive symptoms was 1.22 (±1.68). Finally, the mean on the WURS scale was 21 points (±13.66). The academic level of the parents was 10% elementary school, 20% middle school, 16.7% technical school, 6.7% high school, 43.3% bachelor’s degree, and 3.3% master’s degree. The study sample comes from Guadalajara’s mestizo population, as defined by Leal et al14 in their human leukocyte antigen study. The inclusion criteria were 1) IQ ≥80 and 2) no neurological or psychiatric disorders. 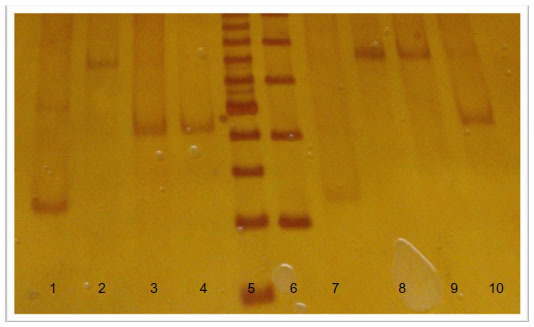 Figure 1 DRD4 gen polymorphisms by electrophoresis in polyacrylamide gels stained with silver nitrate. Notes: Each lane represents an individual DRD4 genotype. Lane 1: heterozygous for 2/5 repeats; lane 2: homozygous 7/7 repeats; lanes 3 and 4: homozygous 4/4 repeats; lanes 5 and 6: molecular weight ladder, 50 and 100 bp; lane 7, laboratory controls, homozygous 2/2 repeats; lanes 8 and 9: homozygous 7/7 repeats; lane 10: homozygous 4/4 repeats. The genotype distribution of the DRD4 III exon polymorphisms in the parents was two individuals (6.68%) with the 2r/2r genotype, one (3.33%) with the 2r/4r genotype, one (3.33%) with the 2r/5r genotype, one (3.33%) with the 3r/4r genotype, 15 (50%) with the 4r/4r genotype, four (13.33%) with the 4r/7r genotype, and six (20%) with the 7r/7r genotype. The gene frequency of the 60 genes was as follows: six 2r polymorphisms (10%), one 3r polymorphism (1.5%), 36 4r polymorphisms (60%), one 5r polymorphism (1.5%), and 16 7r polymorphisms (27%). We found that the parental genotypic frequency was in Hardy–Weinberg disequilibrium (χ2=13.03, P<0.01; P=0.044, Fisher’s exact test), while the statistical difference favored a high number of 7/7 genotypes. This analysis was conducted with an expected frequency of p2=16 individuals, 2pq =12 individuals, and q2 = two individuals, but the observed frequencies were p2=20 individuals, 2pq = four individuals, and q2 = six individuals. In this sample of parents of ADHD cases, the allelic distribution of the DRD4 gene showed a higher frequency of the DRD4-IIIe-4r polymorphism, followed by the DRD4-IIIe-7r polymorphism. This result was expected because DRD4-IIIe-4r has been proposed as a progenitor of the DRD4 gene in humans, and the DRD4-IIIe-7r polymorphism is a mutational event with a positive selection.9 According to these results, the DRD4-IIIe-4r polymorphism could be the wild type in this sample from Guadalajara, which would mean that it is similar to other frequencies around the world (see Table 1). These results contrast with those of Chang et al,10 who argue that the DRD4-IIIe-7r polymorphism is the most prevalent one in Native Americans; but in all other regards our results are similar to reports on European populations. Thus, our findings suggest that the population of Guadalajara is the product of a mixture of different peoples, as Leal et al14 have pointed out. According to the Hardy–Weinberg model and the gene frequencies from this study, a significant difference was found between the expected and observed genotypes. This disequilibrium is related to an over-representation of DRD4-IIIe-7r polymorphism homozygosity. Although these results are from a small sample, their presence is significant when compared with both an open population study conducted in Mexico City by Martínez-Levy et al,19 who found a Hardy–Weinberg equilibrium of polymorphic variants of DRD4, and the work of Flores-Aréchiga et al,20 who demonstrated a similar gene frequency between populations in Jalisco and Mexico City. Thus, the unexpected disequilibrium found in our study suggests that the presence of DRD4-IIIe-7r is directly related to the selection of the parents of ADHD cases. In conclusion, this study illustrates the value of considering the genetic analysis of parents of ADHD children to better understand the relationship between genetic and environmental factors in the expression of the behaviors related to this disorder. In light of these results, future studies could be conducted to further explore this important issue. However, it is important to highlight some limitations in relation to future studies: 1) the small sample size means that we must be cautious in terms of generalizing these results, although the quantity of 60 chromosomes is not a negligible size for such genetic population studies; 2) the fact that no control group consisting of parents of typical children was included; and 3) the need for molecular genetic association studies that replicate our results. This work was supported by Mexico’s National Council of Science and Technology (Consejo Nacional de Ciencia y Tecnología – CONACyT, Grant Number #84494). Participating investigators: Omar Barrios, Yaira Chamorro, and Lourdes Bolaños, who provided and cared for study participants. ST, EM, and MdLR-D contributed to the conception and design of the experimental protocol and to the analysis and interpretation of data. They also drafted and revised the paper and gave final approval for the version to be published. JT-F contributed to data acquisition, the drafting and revising of the paper, and final approval of the version to be published. American Psychiatric Association. Diagnostic and Statistical Manual of Mental Disorders Fifth Edition. Arlington, VA, USA. 2013. Franke B, Neale B, Faraone S. Genome-wide association studies in ADHD. Hum Genet. 2009;126(1):13–50. Johns Hopkins University, Baltimore, MD. MIM Number: 1434652013. Faraone S, Perlis R, Doyle A, et al. Molecular genetics of attention-deficit/hyperactivity disorder. Biol Psychiatry. 2005;57(11):1313–1323. DiMaio S, Grizenko N, Joober R. Dopamine genes and attention-deficit hyperactivity disorder: a review. J Psychiatry Neurosci. 2003;28(1):27–38. Banaschewski T, Becker K, Scherag S, Franke B, Coghill D. Molecular genetics of attention-deficit/hyperactivity disorder: an overview. Eur Child Adolesc Psychiatry. 2010;19(3):237–257. Kebir O, Joober R. Neuropsychological endophenotypes in attention-deficit/hyperactivity disorder: a review of genetic association studies. Eur Child Adolesc Psychiatry. 2011;261(8):583–594. Aguirre-Samudio AJ, Nicolini H. El gen receptor a dopamina D4 y su asociación con los trastornos mentales. Rev Invest Clin. 2005;57:65–75. Ding Y-C, Chi H-C, Grady D, et al. Evidence of positive selection acting at the human dopamine receptor D4 gene locus. Proc Natl Acad Sci U S A. 2002;99(1):309–314. Chang F-M, Kidd J, Livak K, Pakstis A, Kidd K. The world-wide distribution of allele frequencies at the human dopamine D4 receptor locus. Hum Genet. 1996;98(1):91–101. Langley K, Marshall L, Bree M, et al. Association of the dopamine D4 receptor gene 7-repeat allele with neuropsychological test performance of children with ADHD. Am J Psychiatry. 2004;161(1):133–138. Sistema Educativo de los Estados Unidos Mexicanos. Ciclo Escolar 2002–2003. Secretaria de Educación Pública. Available from: http://www.sep.gob.mx/work/models/sep1/Resource/1899/1/images/publicacion2003.pdf. Accessed December 12, 2014. Ward M, Wender P, Reimherr F. The Wender Utah Rating Scale: an aid in the retrospective diagnosis of childhood attention deficit hyperactivity disorder. Am J Psychiatry. 1993;150(6):885–890. Leal C, Mendoza-Carrera F, Rivas F, Rodriguez-Reynoso S, Portilla-de Buen E. HLA-A and HLA-B allele frequencies in a mestizo population from Guadalajara, Mexico, determined by sequence-based typing. Tissue Antigens. 2005;66(6):666–673. Miller SA, Dykes DD, Polesky HF. A simple salting out procedure for extracting DNA from human nucleated cells. Nucleic Acids Res. 1988;16(3):1215. Muramatsu T, Higuchi S, Murayama M, Matsushita S, Hayashida M. Association between alcoholism and the dopamine D4 receptor gene. J Med Genet. 1996;33(2):13–115. Vieyra G, Moraga M, Henríquez H, Aboitiz F, Rothhammer F. Distribución de alelos de los genes DRD4 y DAT1 del sistema dopaminérgico en la población mixta de Santiago de Chile. Rev Méd Chile. 2003;131:135–143. Rodriguez S, Gaunt T, Day I. Hardy–Weinberg equilibrium testing of biological ascertainment for Mendelian randomization studies. Am J Epidemiol. 2009;169(4):505–514. Martínez-Levy G, Benjet C, Briones-Velasco M, Pérez-Molina A, Nani A, Sabás C. Genetic variability study of DRD4 and DAT1 in the urban population of Mexico City. Salud Mental. 2013;36(3):189–192. Flores-Aréchiga A, Gómez-Espinel I, Castro-Cárdenas L, Treviño-Zúñiga J, Silva-Ramirez B, Cerda-Flores R. Estructura genética de tres poblaciones mexicanas en base al sistema HLA-A. Revista de la Facultad de Salud Pública y Nutrición. 2009;10:4.